This issue occurred to me once in the past, but it was for a different reason. The first time it was because I had setup a Magento install with a domain of http://localhost. 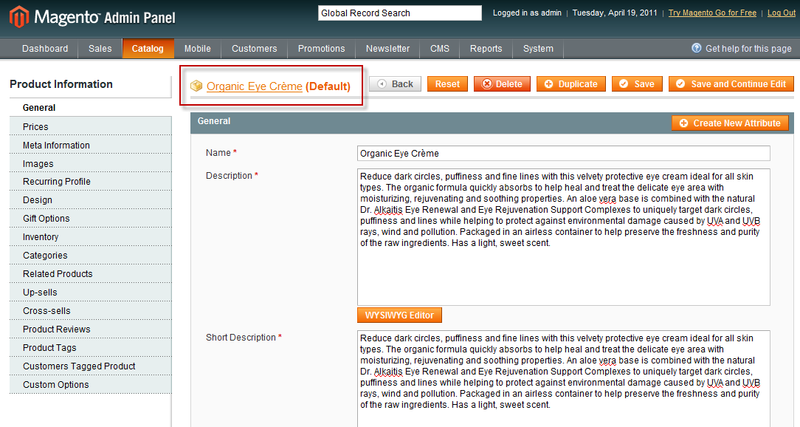 Magento only likes domains with dots in them. My new install does not have this problem, so what was causing the problem. And why was this only an issue with Chrome? I was able to login with firefox without an issue. It turns out that my virtual machine is running a different date than my desktop. After reading a few posts, the best solution was to update the cookie lifetime in the configuration settings. I had to increase it significantly to 1000000, after saving the new configuration, the problem was resolved and I could use Chrome to login again. I’ve just released a second small helper extension for Magento. On a past project, the store had about 200 configurable products, some having over 1000 associated simple products. To the customer, only the configurable products were in the catalog, all the simple products where hidden. We noticed that in the category edit area, when we selected products to add to the category all the products in the catalog were available. Because the sku names for the associated simple products were so similar to the configurable parent product, sifting through pages of products became too time consuming. Also, it didn’t really make sense as to why the product grid in the Category -> Category Products tab didn’t have similar search filters as the main product management grid in the admin. 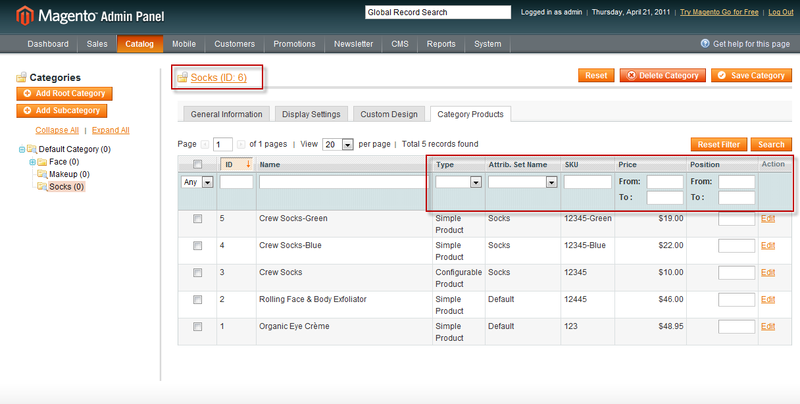 This module adds more search filters columns to the Category -> Category Products tab and helps to extend the admin. As a bonus, the category name will be hyperlinked to the url for the category on the front of the site. In order to get around this issue, the package contains a modified version of the file design/adminhtml/default/default/template/catalog/category/edit/form.phtml and will overwrite the original file. Finally. I’ve been talking about it for a while now, and uploaded my first Magento extension. The extension is called Admin Product Preview Link. Right now its in pending stage, but will provide an update when it goes live. The extension is fairly simple, but I’ve found it useful from an administrator perspective. After making changes and updates to a product, it’s always good practice to do a quick sanity check of the product page on the front of the site. It’s those times when you’re just in the admin area and don’t feel like opening a new browser and navigating to your product. This extension will hyperlink the product name and create a link that will open up the front-end product page in a new browser window. MagentoConnect used to have the download stats for paid extensions. No more. magentopop – is it just me? I thought the name magentopop was catchy. It’s going to be a destination for detailing experiences with magento e-commerce. Today I was looking at the name again, maybe it is the font, but does the name look like magentopoop? Wanted to share a description of my development environment for magento. This post will be an overview of some of the tools and pieces you’ll need to get a nice dev environment going. This setup is based on my experience developing on Windows. It should be applicable to Mac and linux as well, since I’ll focus on opensource products here. There are a few assumptions here. The main one is that we will be developing for a linux production server. First thing is to get yourself the magento vm from turnkey linux. Turnkey is a great download that saves a lot of the headache of having to setup magento by yourself. If you want to do the setup from scratch, that’s fine too. Just download their basic LAMP appliance and you can take it from there. All the appliances are now Ubuntu 10.04 which is a nice bonus. You’ll need a vm player, so you cnn use the one from VMWare (that’s what I’m using) or you can use Oracle’s VirtualBox. Both are great products. Once you have the vm up and running, you’ll need to connect to it. Since I’m on windows, I can’t live without winscp and putty. Together, they are a great combination and you can connect to the vm like it is your production box. Make sure to install putty first. I also recommend setting up samba so that you can map /var/www as a network drive to your windows host. This is really a great way to work. It will allow you to run any IDE and see the remote files locally through the mapped network drive. As for an IDE, there are a ton of options. Depends what mood I’m in, but I’ve grown fond of netbeans. ZendStudio is great as well. Both have the autocompletion tools you’ll need, as well as the ability to hyperlink functions and class names to their parent source files – a must have tool when dealing with magento. And of course you’ll need some source control. I’m a git fan. Download tortoisegit and get yourself a free account on unfuddle where you can have unlimited repositories.